Institut fur Oekologie, Friedrich-Schiller-Universitat Jena. 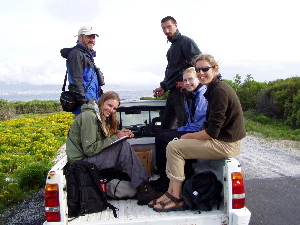 On 22nd September, Dr Hans-Ulrich Peter and 12 of his students from the Institute of Ecology, Friederich-Schiller University (Jena, East Germany) arrived in Cape Town. Each year the students travel to different parts of the world to gain experience in the design, execution and writing up of research projects. 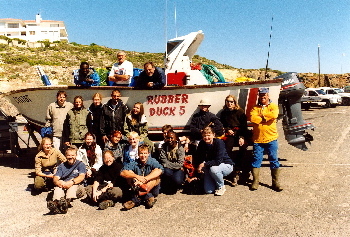 This year, due to a fortunate meeting between Hans-Ulrich, John Cooper and Les Underhill, the students were able to visit two Western Cape offshore islands. There, they were engaged in various mini-projects which ADU staff and students had planned prior to the visit. WATCH THIS SPACE for a full description of the project aims, methods and results. 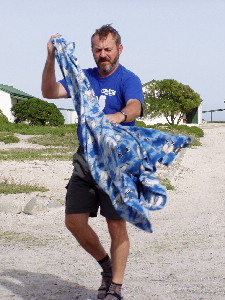 On the 20th September, the group left their mainland base at the Green Elephant Backpackers in Observatory, for Yzerfontein on the West Coast. From there, skipper Neville Tait transferred copious amounts of luggage, equipment, food and people across to Dassen Island. The rest of the week was spent gathering data for the various projects. 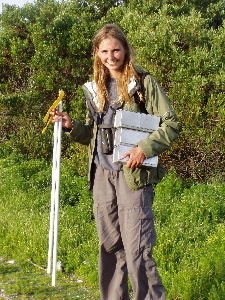 Silvia Kirkman and John Cooper (both ADU) had planned an estimation of the abundance of European Rabbits on Dassen and Robben Islands. 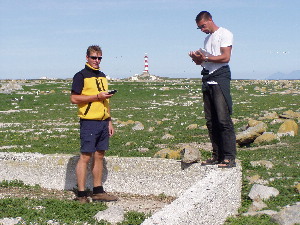 Transects were generally surveyed in the early morning. 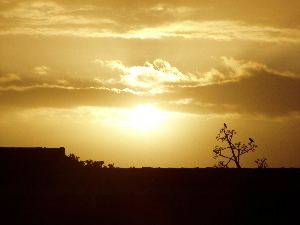 Also off to an early start was the Cape Wagtail ringing project, led by Vincent Ward (ADU). 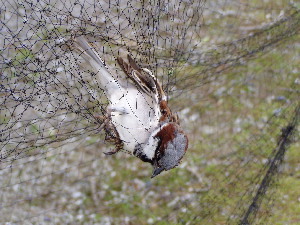 In the hopes of estimating the abundance of these birds on the island, mist nets were set and checked regularly after sunrise and before sunset each day. 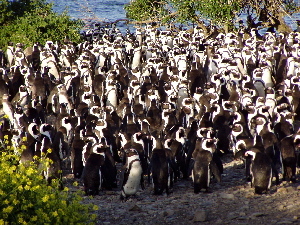 The rest of the morning was used to test the influence of tourist group size on the behavioural reactions of beach groups of African Penguins, a project that Marienne (ADU) led. After lunch each day, we cleared all litter on sections of two sandy beaches on the island, to estimate litter accumulation rates. Such was the enthusiasm of Hans and his students that the beach cleaning effort was extended beyond the project boundaries, and vast amounts of litter were eventually removed from the island. 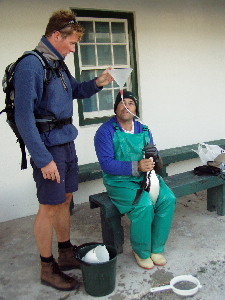 In the late afternoon, diet samples were extracted from various unwilling penguins on the northern and southern side of the island. 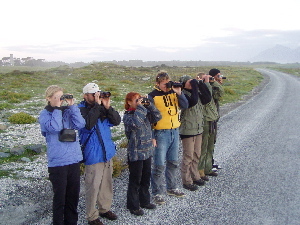 To supplement this comparison of foraging patterns on opposite sides of the island, morning and evening observations of penguins leaving for and returning from sea were also made. Bruce Dyer (MCM) led this project. 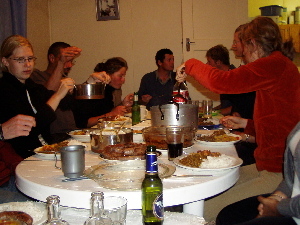 Evenings on the island were spent cooking enormous meals (producing food for 17 people is quite a challenge), summarising the activities of the day and planning for the following day. And, of course, socialising. The latter included a snoek braai, an impromptu slideshow by the Jena students of their trip so far, and another slideshow in which Vince provided a fascinating look at gannets and Marienne reminisced about the work she did years ago on African Wild Dogs. Everyone enjoyed the company of Elton Heckler (WCNCB) and of two other students conducting research on the island, Juliette Nansikombi (PercyFitz Institute, UCT) and Newie Makhado (ADU & MCM). The visit to the island ended in true Survivor style. Since fresh water on Dassen is limited, bathing for the week was prohibited and personal hygiene suffered. Now, with bad weather threatening to keep us hostage on the island, food rations were introduced. Despite all this, the Jena group maintained high spirits, proving that they have what it takes to survive in Africa! As if to show their approval, the wind dropped and the sun shone, allowing us to escape from Dassen on the 28th September as planned. After a day in Cape Town, the team transferred to Robben Island on 30th September. Compared to the Spartan accommodation on Dassen (where the students occupied the old bunk-houses that were once used by guano scrapers and egg collectors), life on Robben was quite luxurious. The team was most appreciative of hot water on tap, daily showers, thick mattresses, electricity on demand, and the opportunity to buy chocolates at the nearby staff shop. As on Dassen, the research programme was pretty full. The days usually began with the rabbit transect, conducted from a vehicle and running through the main habitat types on the island. More disturbance experiments were conducted, this time testing the effect of speed of approach on the behaviour of one beach group of penguins. 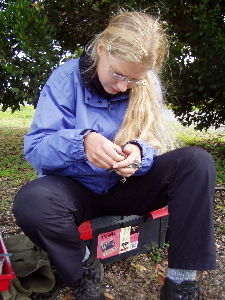 Under Silvia's direction, small mammal traps were set out to investigate the abundance of mice and rats in one part of the penguin breeding colony. In the early afternoons, Kathy Calf (ADU) and Tamara Robinson (Zoology Dept, UCT) led a project investigating the abundance of an invasive species of mussel (a potential food source for Oystercatchers) around the coast. 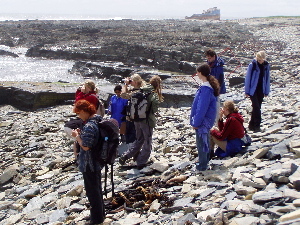 Litter accumulation rates were investigated on Robben Island's one and only sandy beach. 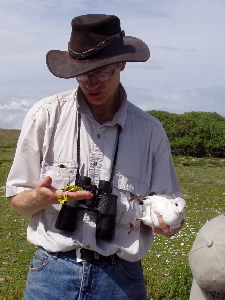 Doug Harebottle's plans to record foraging patterns at the island's heronry were confounded because the heronry had not yet formed, but he and Dieter (both of the ADU) helped the students to identify and count those species that were present, and Dieter led a Cape Weaver ringing project. The Jena team left Robben Island on 6th October and the following day presented the results of their projects at a seminar session at the ADU. Various ADU'ers, and Peter Ryan from the PercyFitz Institute, reciprocated by describing their own special research interests. Although the team has now returned to Jena, an important link has been forged between the University of Jena and UCT. The students gained useful research experience and were exposed to a host of local conservation issues. Project co-ordinators from the ADU benefited from the opportunity to design and implement a range of research projects, and from their interactions with students from another country. The results of the projects will be made available to the management bodies of Dassen and Robben Island and may influence future management decisions. At the very least, they may suggest and provide the impetus for future lines of research at these two important seabird breeding sites. We look forward to continued co-operation with Dr Hans-Ulrich Peter and the Institut fur Oekologie, Friedrich-Schiller-Universitat Jena. Hans-Ulrich, Anja Kahles, Anja Nordt, Antje Gorshowski, Eric Heinze, Juliane Amlacher, Kerstin Schultz, Linda Jung, Lutz Merbold, Ramona Muller, Regina Fache, Rene Muller and Viviane Sternkopf. For their enthusiasm, excellent company and exchange of ideas. Tamara Robinson, Zoology Department, UCT, for input into the shellfish project.